Archer, still known as Angela to his family, comes home to the Pacific Northwest to find everyone in transition. Pops, suffering from diabetes, likes to sneak off for sugar binges. Mom is anxious and angry. Very hard-of-hearing Grandma is obsessing about getting her “granddaughter” married. Even the forest is changing. From the roots under our feet to the heavens above, the mysteries of the human heart help us navigate constant change. 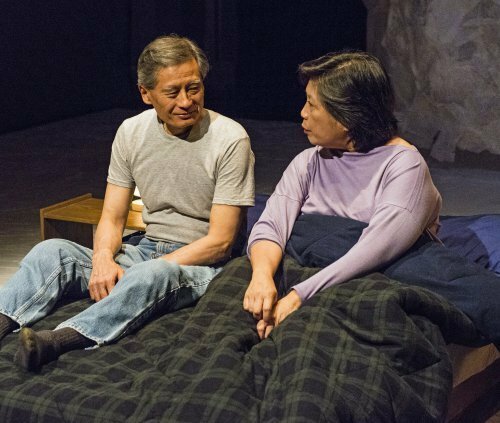 This dreamy, short family drama is winningly performed by an Asian-American cast and is dynamically presented. Kaufman’s dialogue is a wonderful combination of simplicity and the poetic. The characters all grandly express themselves with mystical overtones. Most crucially Kaufman endows them all with tremendous warmth and humanity. Besides achieving these sensitive performances, director Ken Rus Schmoll has also superbly coordinated the production’s superior design components into an enthralling presentation. NAATCO totally proves their mission with this production. 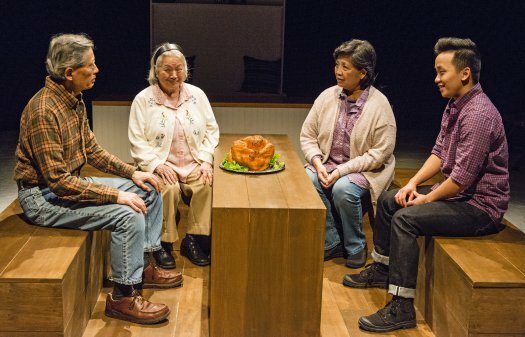 With their magnetic work, the Asian-American ensemble transcends the standard view that these characters would have to be performed by Caucasians. Poignant and engrossing, Sagittarius Ponderosa is a rich experience. In a play in which the unspoken is of particular importance, the entire cast does well, starting with Bex Kwan as Archer, whose often curt delivery might seem monotonous but for the actor’s ability to suggest a world of feelings hidden under the words. Mia Katigbak, always a pleasure to have around, is fine as one of those women who reacts to a crisis by being busy. Kubota is immensely likable as Bob, especially when in search of the junk food that his doctor has forbidden. Virginia Wing is winsome as Grandma, but she can also lash out with surprising anger, venting her hatred for a hearing aid that leaves her with a constant buzzing in her ears. As Owen, Daniel K. Isaac has a laconic charm that makes you want to see him and Archer get together. The director, Ken Rus Schmoll, handles this delicate material with the sensitivity it requires. 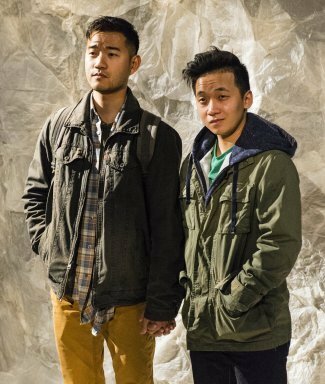 BOTTOM LINE: A step in the right direction to present more authentic trans Asian American stories. Sagittarius Ponderosa centers around Archer (Bex Kwan) and his family. Pops (Glenn Kubota) struggles with diabetes, Archer cannot get his family to recognize him as male (they still refer to Archer as “Angie,” “her,” and “my daughter”), and Grandma (Virginia Wing) is banking on her “granddaughter” getting married. Ironically, for a character who takes so much pride in his Sagittarius astrological sign – a sign, named for a constellation of a hunter, that is known to shape the personalities of driven, goal-oriented dreamers = Archer is paralyzed and utterly lost, without certainty that his family loves him for his true identity. Throughout the play, the building blocks of loving relationships are slashed, burned, and recycled as the family finds a new balance in the shade of the nearby Ponderosa forest. 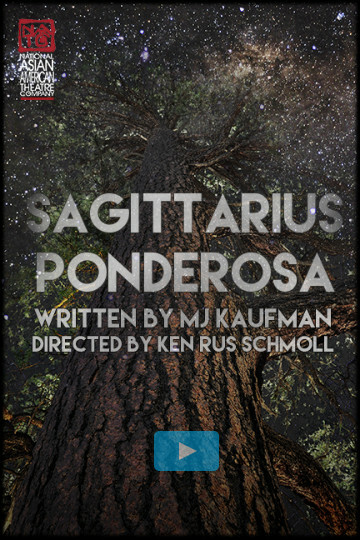 There are other aspects of Sagittarius Ponderosa that make the 60-minute one-act worthwhile. Katigbak, who also acts in the production, delivers sensitivity and strength as Archer’s mother, giving the best performance of the whole ensemble by far. Her specificity in depicting her complex grieving process adds depth and color to what could be telegraphic and monochromatic lines. And the lighting and sound design (by Oliver Wason and Miles Polaski respectively) blend beautifully together to create an ethereal, foreboding winter landscape. And of course at the end of the day, representation of both Asian Americans and trans people matters, and the intersectional representation of trans Asian Americans is all too rare. Thanks to work like Sagittarius Ponderosa, NAATCO is able to help bridge this gap while employing trans artists, making themselves not only allies to the trans community, but also leaders in making more authentic representations of trans people, Asian Americans, and LGBTQIA people of color in general. This program is supported, in part, by public funds from the New York City Department of Cultural Affairs in partnership with the City Council. It is also made possible by the New York State Council on the Arts with the support of Governor Andrew Cuomo and the New York State Legislature.